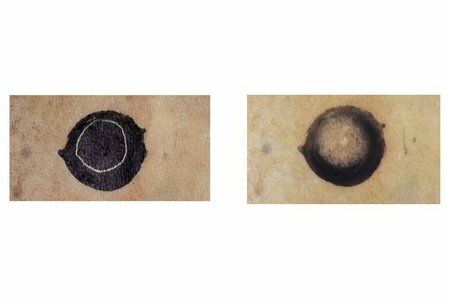 Recently, I completed work on my MA thesis which was entitled: A comparative investigation into the off-gassing properties of three brands of EVA and PVAc adhesives currently used in book conservation. Having worked previously in book and paper conservation labs, I understood that creating custom enclosures to house materials can be a large part of the job. Clamshell boxes not only look great, but provide excellent protection, and are often created to house some of the most vulnerable and valuable items in a collection. The creation of these enclosures usually involves covering the box with some style of book cloth that is adhered with a layer of PVAc or EVA. These adhesives are known to off-gas some quantity of acetic acid, and I was interested to know how different brands compared to one another regarding the amount of acetic acid they were off-gassing, and how much the levels were affected and reduced by allowing the box to off-gas or air out, before closing it up with valuable items inside. 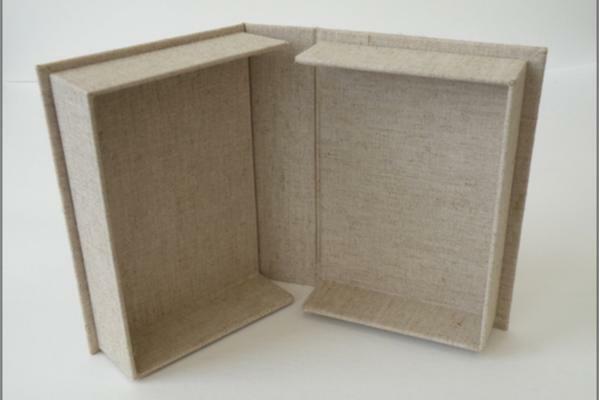 In this blog post, I have used clamshell boxes as a relatable example of an enclosed space, but the research was intended to measure levels of off-gassing in any space that a paper-based object might be enclosed in, like a box or a sealed museum case. In my experience working in book and paper conservation, sometimes projects can call for a large quantity of boxes to be made at one time, and due to demands on time and space, allowing these boxes to off-gas for any considerable length of time is simply not possible. Research has been done in this area in the past, most notably at the Canadian Conservation Institute. In the 1980s and 90s they conducted long term research on the aging properties of a wide variety of adhesives, including various EVAs and PVAcs. 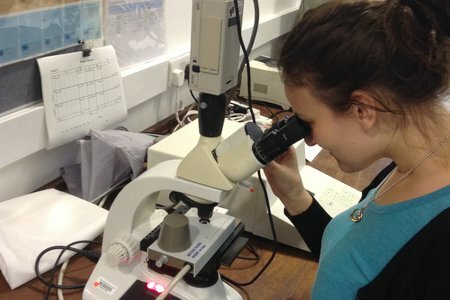 Their research was ultimately published in the Adhesive Compendium for Conservators by Jane L. Down (2015), as well as in several articles that were published over the course of the research. While they did not focus heavily on off-gassing, they did recommend that EVA and PVAc adhesives be allowed to off-gas for 30 days. I took this research into consideration when designing the tests for my own research. I chose three popular adhesives to study, which were Conservation by Design's Evacon R™, Preservation Equipment Ltd's EVA Neutral pH Adhesive, and PEL's White Neutral pH Adhesive, which is a PVAc. 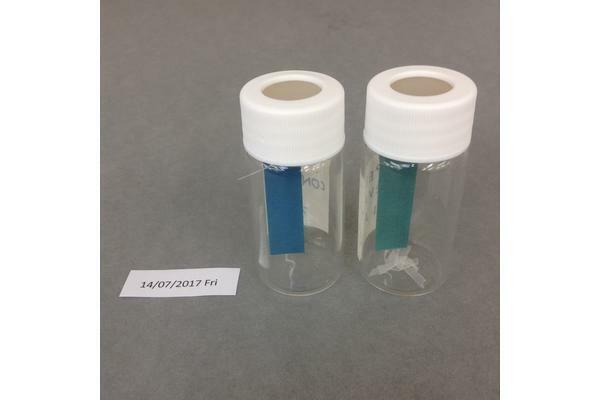 I cast three samples of each adhesive, allowing the first one to off-gas for 1 day, the second for 7 days, and the third for 30 days. This created a lot of samples to be tested, but also some interesting data to be interpreted. I chose to test the adhesive samples in three different ways, first using Acid Detection strips suspended in small glass vials with the samples. AD strips were originally created to monitor deterioration in acetate film. Since they were designed to detect acetic acid, they were useful in this case as well. I created a small army of samples so that each adhesive type could be tested three times, to ensure the reliability of the results. The samples were observed daily over a week, noting any visible signs of colour change in the AD strips. At the end of the week the AD strips were tested using spectrophotometry, in which the final change in colour was then evaluated against the control. 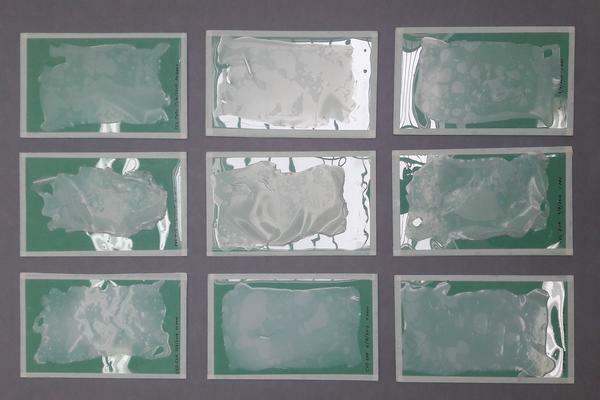 In this test, it was found that all of the strips changed to some degree, but the CXD EVA showed the least amount of acetic acid off-gassing. The next test I performed was a standard 3-in-1 Oddy test. I again prepared a small army of samples which included the adhesive sample, along with a silver, copper, and lead coupon enclosed in an Erlenmeyer flask which was then heated to 60˚C for 28 days. The three different metals are used to detect different VOCs that are being emitted from the sample. After the allotted period in the oven, the metal coupons were removed and observed for corrosion, according to the guidelines laid out by Thickett and Lee in their article "Selection of Materials for the Storage or Display of Museum Objects" (2004). The results of an Oddy test are subjective in their interpretation and I found that different institutions allow for different levels of change in the coupons. I found that the lead coupons changed in all cases, indicating the presence of acetic acid. 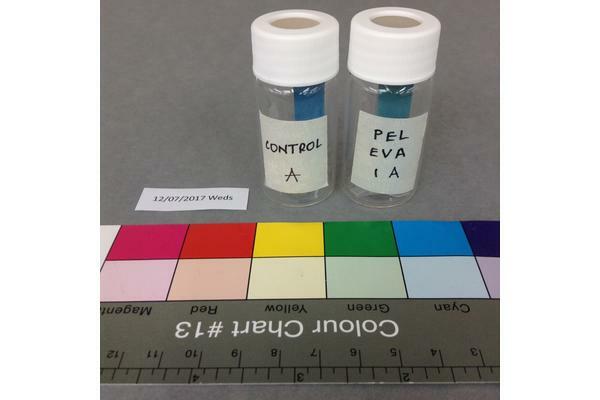 In general, in this test, both EVAs performed better than the PVAc, which blackened the copper coupons as well as depositing white corrosion product on the lead. 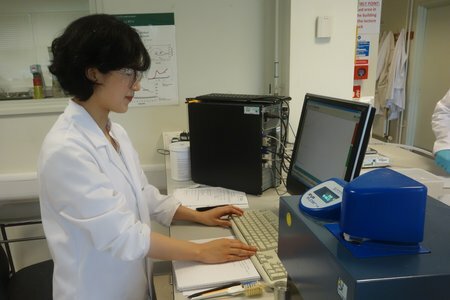 Finally, I was able to send some samples to the University of Sussex for analysis by gas chromatography-mass spectrometry. The analysis was undertaken by Chris Dadswell, and I was fortunate enough to be able to visit the lab and watch the process in action. 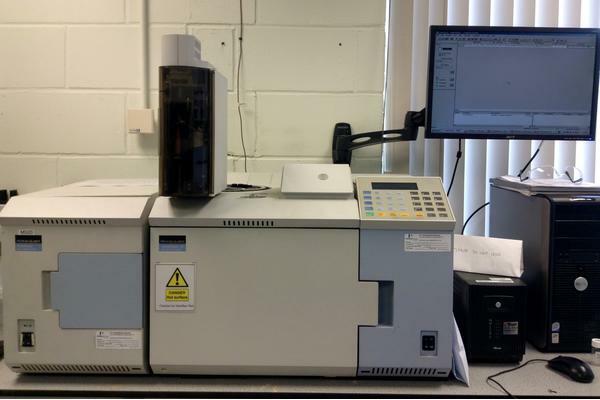 GC/MS is an analytical method used to determine the presence of organic materials from their chemical composition. 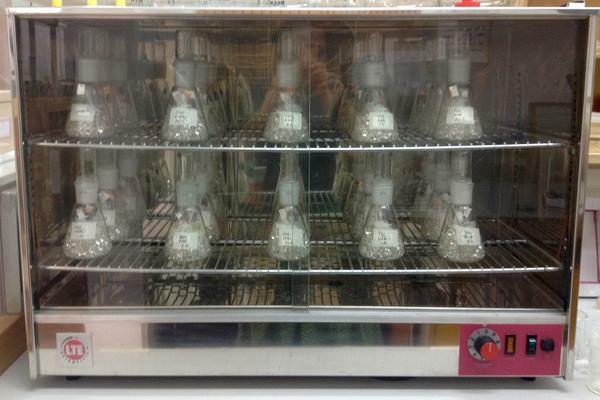 A sample of the air in the vial with the sample (headspace) was injected into the machine. The sample then travels down a long coil where it is separated into its chemical components which can then be interpreted by the machine. In this case the instrument was set to specifically detect acetic acid, and so any other volatile organic compounds that may have been present were not covered in this study. 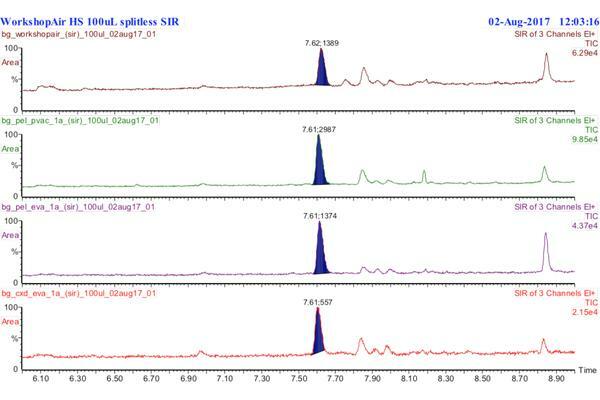 Figure 7: A sample of the spectra obtained using GC/MS. The blue peaks indicate the presence of acetic acid. Initially I had predicted that GC/MS would give the most sensitive and thorough results of the three tests. However, in some cases, the GC/MS was not able to detect acetic acid, or the levels detected were less than those in the vials without adhesive samples. 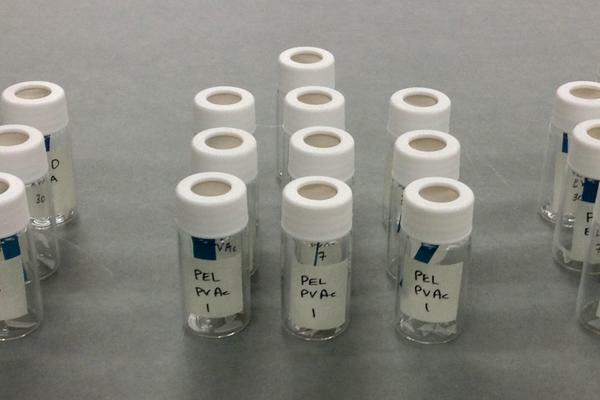 PEL's PVAc was the only adhesive that showed significant results in the GC/MS testing. These samples did show a trend towards decreasing levels of off-gassing VOCs in the samples that had been allowed to off-gas, or air, for longer periods. The conclusion I came to after this testing was that CXD's EVA was emitting the lowest levels of acetic acid off-gassing of the three samples tested, and that the presence of VOCs emitting from dried adhesives does diminish over time. Therefore, the generally recommended 30 day off-gassing period is still advisable. However, as this is not always possible for a variety of reasons, off-gassing for as long as possible is the best rule of thumb. Although similar testing has been done at other institutions, it is important to test current adhesives since recipes can change without notice. This research also provides a useful framework for testing adhesives and other products that may be off-gassing harmful VOCs. As I'm sure is often the case, this research could have been much bigger and gone on for years. As soon as the research was completed I had more ideas for further study and other avenues that could be followed. It would be interesting to now take this research in a more quantitative direction to try to understand how specific amounts of acetic acid off-gassing affect historic books and paper in enclosed spaces and to what degree. Although it was hard work, it was a privilege to be able to spend the time doing this in-depth research with the facilities and expertise available at West Dean and the University of Sussex. As well as producing a thesis that can hopefully be of use to the greater conservation community, I learned a lot about these analytical methods and research techniques that I will carry into my future career. The full thesis is available in the Library at West Dean College. The research will also be presented at the upcoming symposium of the Book and Paper Group of the Australian Institute for the Conservation of Cultural Materials, in November.